I am always looking for quick, easy and tasty recipes using our favorite vegetable and this recipe fits the bill perfectly. I found this recipe for a cold green bean salad in The Charleston Gazette. This is the perfect easy side dish for any night of the week, and it's the perfect make ahead barbecue dish. 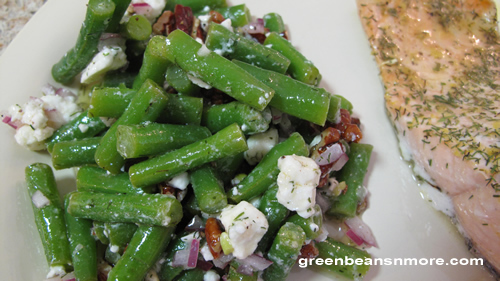 This recipe features blanched green beans in a vinaigrette with dill and garlic topped with feta cheese, red onions and roasted pecans. We had this cold green bean salad alongside simple baked salmon with lemon and dill. It was a perfect light summertime dinner. The nice thing about a recipe like this is that you can use more or less of the garlic, feta cheese, red onions and pecans to suit your taste. COOK green beans in large saucepan of boiling water, about 4 minutes. Drain, immerse in cold water, drain, and pat dry. COMBINE olive oil, dill, vinegar, garlic, salt and pepper in a small bowl. Whisk to blend. PLACE beans in a shallow serving dish. Toss with dressing. SPRINKLE with pecans, red onion and feta, toss and serve. Cooks Tips: I used the 1 1/2 pounds of green beans called for in the original recipe and found there was more than enough vinaigrette, feta, red onions, etc. that I could have used a full 2 pounds. I also squeezed the juice of 1/2 lemon over the dish before I served it as I think it needed something to brighten it up a bit. I toasted the pecans in a 350 degree oven. I placed the pecans in a single layer on a sheet pan and cooked them almost eight minutes, checking them and stirring them frequently.